Japan monopolized the podium, but every titleist at the 2011 Osaka International Challenge was a first time winner. Keigo Sonoda, a 20-year-Japanese, won his first international title in Osaka this weekend. Sonoda beat his opponent Sho Zeniya 18-21, 21-16, 21-16 in the men’s singles final. 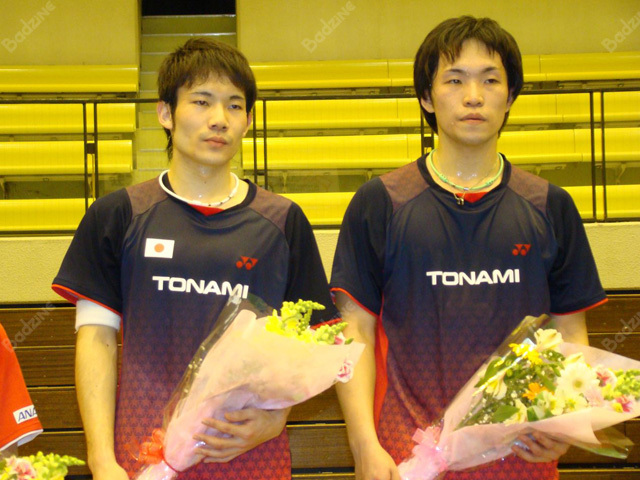 He also took the men’s doubles title with Takatoshi Kurose. In the women’s singles, Minatsu Mitani – who forewent this year’s Australian Open despite having been runner-up in Melbourne last time around – prevailed rather easily over 2008 Osaka champion Megumi Taruno in two games. Koharu Yonemoto took the mixed doubles title but didn’t quite have enough to seal a second and had to settle for runner-up in the women’s doubles final, where she and Yuriko Miki lost in three. The last non-Japanese competitors departed in the men’s doubles semi-finals, where Chinese Taipei’s Tsai/Tseng fell to eventual runners-up Wada/Watanabe. This year’s field was severely weakened by the en masse withdrawal of the entire Korean, Thai, Macau, and Singapore contingents in mid-March.